Its been a while since my last blog, which is all my own fault, putting it off each week as the adventures & finds slipped by, no excuse for it! 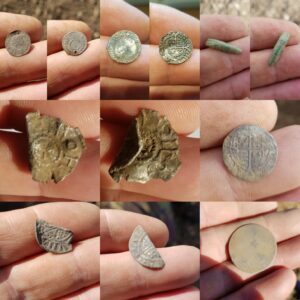 I headed to the lower areas of the new field whilst Gaz went straight down the middle, using his new Teknetics G2+ he was soon walking over to me with a grin on his face, he held his hand out and revealed two hammered coins! One a cut half short-cross and the other a slightly broken full penny! What a start that is! It seemed we had made the correct decision as the field was lively, broken pieces of bronze artefacts, buttons, lead, I just knew good stuff was hiding in the soil, interestingly I noticed a few animal bone fragments , pottery and full oyster shells, which is a classic sign of a productive site. I wandered with no particular search pattern, my plan was to cover ground, as much as I could to see if I could hit a hot-spot, finds kept on coming, nothing major but tantalising broken parts of medieval artefacts, studs, buckle plates etc then mid afternoon I hit a sweet target and scrambling through the soil I noticed the outline of a small silver coin like object, now that split second before you pick it up images of those small pewter type buttons flash through your mind but once picked up you feel for that dimple or smoothness which straight away tells you what it is, this time it turned out to be a half decent Queen Elizabeth penny,I decided to stick around this area and a few more interesting targets came to light, one was potentially a small Saxon mount, and one or two broken artefacts still to be identified. I blazed a straight line right down to the lower stretches of the field and back , around an hour later i picked up my previous footprints in the plough soil, a decent two way signal on the G2+ soon had me holding an exquisite hammered coin, again another queen Elizabeth coin but this time twice as good as the first, condition wise, I was over the moon with it as I have a soft spot for “Lizzie” coins, my first hammered was a sixpence of her reign and I will never forget it. I walked over to show Garry the coin(s) and in return he showed me a lovely pipe tamper he had unearthed, along with a superb Charles the second maundy penny, you know the machine is working well when she winkles out coins of that size I told him! We chatted about the potential of this field for a few minutes then we were back at it, the weather was superb, no mud either which has dogged us for the last 3-4 months. An hour or so passed by and i was enjoying everything around me, bird song, sunshine, fresh-air and a few nice finds, then a slight signal came through, certainly not the best of the day but one that was well worthy of investigation, down on my knees, a scrape of the soil had me peering at a badly twisted piece of silver, a close inspection I noticed some lettering, “o” and an “f” maybe? Wow I thought this looks like a king Offa penny!” Clearing my head a little I could see plainly that this was a special and ancient coin, bent and twisted she has had a hard life but what a coin! Another long chat to Garry about the potential of these fields and we were back at it, only 30 minutes or so to go I decided enough was enough, Im not greedy, far from it and I have had my finds for the day which made me more than happy, before we left for home we even had time to cook some sausage and bacon in the hedgerow for our tea! A fabulous day and one I wont forget in a hurry! When I arrived home it was too late for a proper identification but on Monday morning once our orders at unearthed were dealt with I managed to speak to a friend who is a coin expert and also a kind gentleman from the Fitzwilliam museum, who both agreed it wasn’t an Offa Penny after-all, the good news is its rare and still as equally important as it turned out to be a “King of east Anglia” coin of King Aethelstan, date- circa 837-845 A.D”. 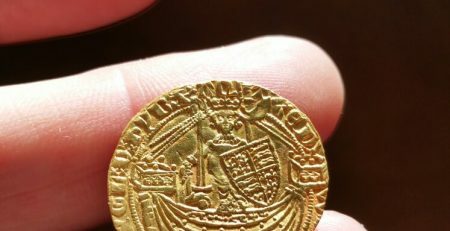 Currently the coin is on its way to being restored so I will do an update on here and social media in the near future, I jumped the Gun in thinking she was an Offa Penny so sometimes it pays to be a little more patient in identifications.. Many thanks for reading! and happy detecting! The Answer Lies within the soil..